I'm sharing a Thank You card today, made specifically to thank Di, who runs the Pixie's Snippets Playground, and it's important to include Parsnip and Dudley in that, too, I suppose, so that they don't feel slighted and run wild. Di just celebrated the end of the 8th year at the Playground, and she's been running it for the last seven. Darnell has organized a large blog hop for those of us who wanted to thank her and you can find the hop here if you're interested. 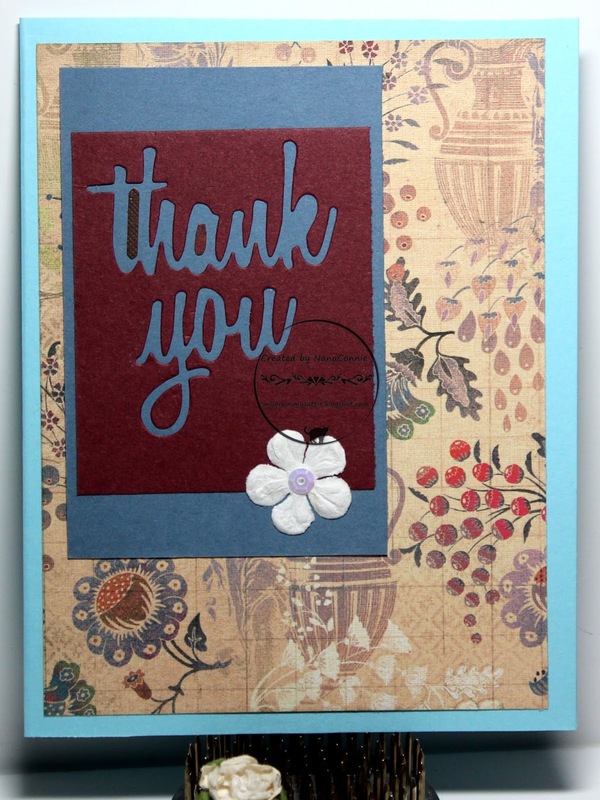 I found a scrap of cornflower blue CS and layered onto it the back of a left-over negative of a "thank you" die cut (Tim Holtz for Sizzix.) Because the piece between the 't' and the 'h' was missing, I cut a tiny, thin, bit of dark burgundy CS which was hanging about on the desk and used it. It doesn't match exactly but was the best I could do with what was available. The flower was cut from a scrap of white paper; I embossed the petals with a stylus and added a white sequin in the middle. I found myself having to make a couple of quick Get Well cards and used an image from QKR Stampede to make each one. 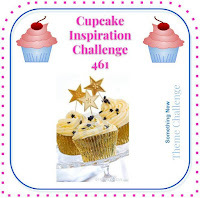 I'm sharing this one today and will share the other next Friday as my DT inspirations for those two QKR Challenges. As always, our theme is "Anything Goes." The image is called "Booboo" and I think it's adorable. Not the first time I've used it, but when it's this cute, who can resist? 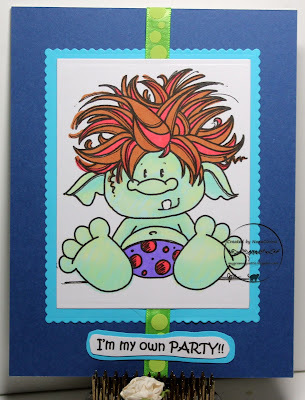 I colored with ProMarkers and a touch of sparkle gel ink on the tear, then cut the image with a die from Memory Box. I cut the frame from dark pink CS with a QuicKutz die. The sentiment was printed, hand cut, and matted. Since this Bug represents the 'groovy' times, I added some sparkly, 'hippy' flowers, added little gem centers, then printed and hand cut the sentiment. 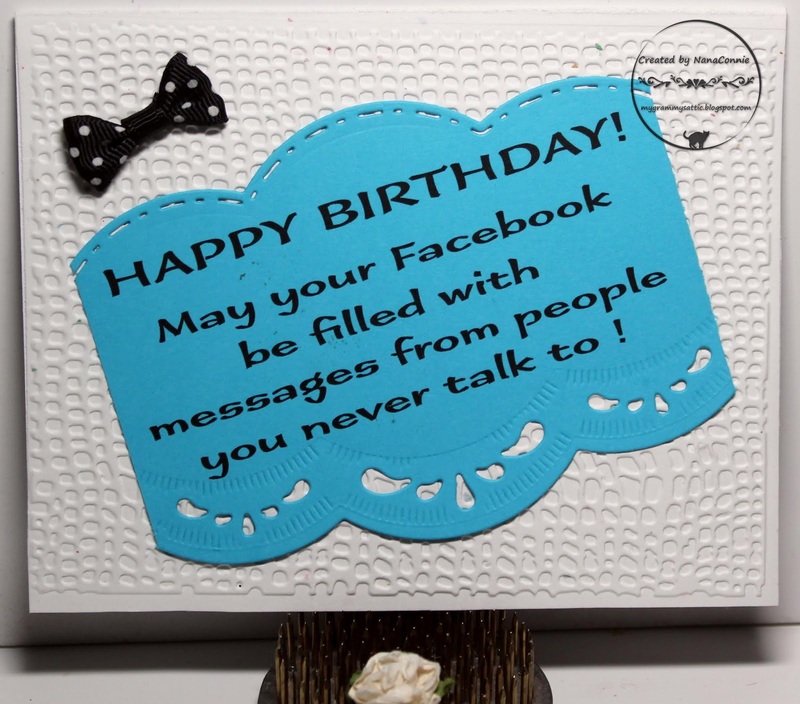 The card base is made with confetti CS. I tried something new with this card and I'm very pleased with the end result. 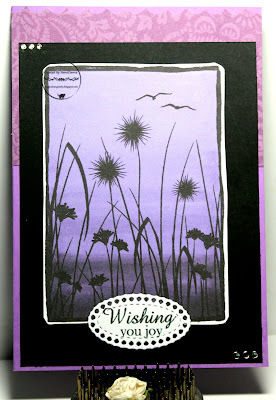 I mixed water coloring and heat embossing with a silhouette image. I started with watercolor paper, painting it with purple to make the ombre background.sky. After letting that dry and ironing it flat (because it had curled from the water), I printed the Silhouette Scene image (Digi Set 493b) from Sparkle N Sprinkle. I drew around the image with a Versa-Mark pen and heat embossed it with matte, smoke gray EP. After it was set, I drew around that with the Versa-Mark pen again and used white EP to make another border. I cut the image by hand just outside the white, embossed border. The sentiment (part of that same set) is printed and cut with an Unbranded die. I mounted both of those pieces onto black CS, then added the three tiny gems in the diagonal corners. I wanted to pop out the lavender sky so I chose a purple card base and added a scrap of dp across the top. Once I adhered the black CS piece with the image, it really pulled the lavender and purple to the fore. 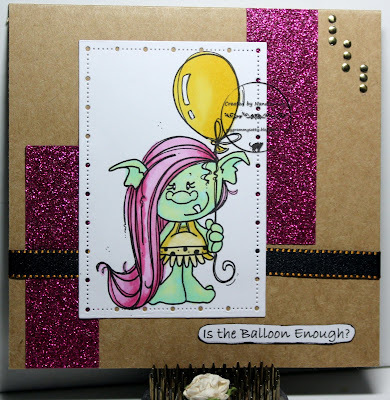 This is the last of the cards for the week long, Birthday Bash at Catch the Bug where they were celebrating their 9th year on the challenge blog. 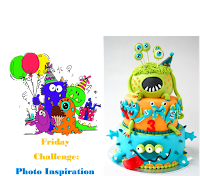 They offered a Bugaboo Stamps freebie (as they always do on Fridays) and I used it, along with the birthday cake image, following this inspiration photo. What better way to banish the winter blues than by having a party and eating cake? I used my ProMarkers to color the images, then fussy cut the little monsters and added them on top of the huge cake image. I printed the sentiment, hand cut it, and inked the edges before adding it to the bottom of this really CAS card. I used a craft knife to distress the edges of the image piece before I mounted that onto an aqua card base. There was already so much going on with the images that I opted for no embellishments, just the images and the sentiment. I may have a post tomorrow, too, if I find the time to write it up. The card is done but I have several folks coming tomorrow at different times throughout the day so we'll just have to see how much I can get done between their visits. This is another post with multiple cards for the week long, Birthday Bash over at Catch the Bug. Today, I'm starting with the card I did for the Tuesday challenge. This sentiment is an image from Bugaboo Stamps and it's a new one for me. 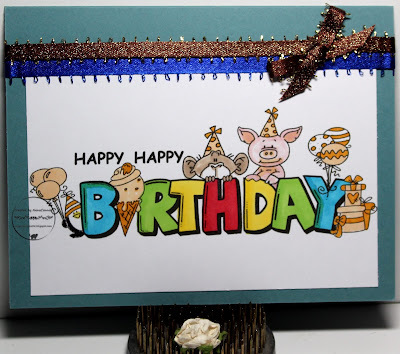 I printed it onto aqua CS and used a black ProMarker to enhance the depth of the color on the "Happy Birthday" portion. 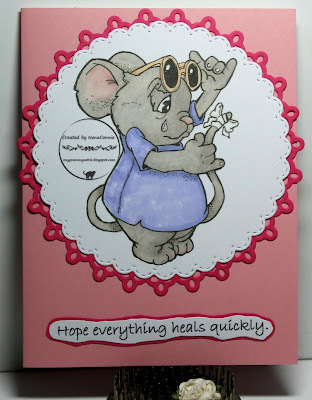 I die cut the sentiment with border dies from Spellbinders. The texture on the white background is dry embossed with a folder from Cuttlebug, another new item for my stash. I used my bow maker to tie the polkadot, bowtie bow. 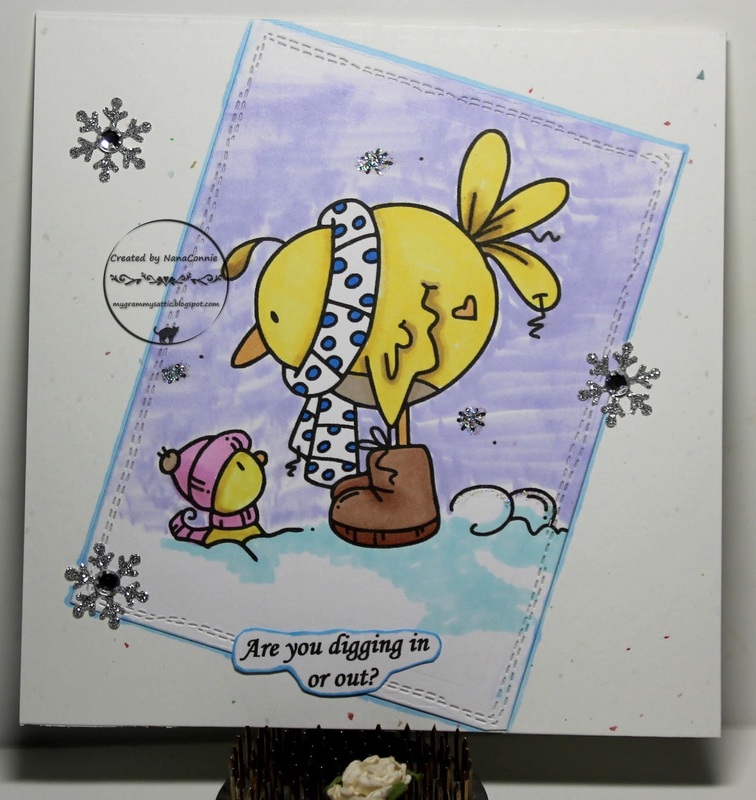 Coloring was done with ProMarkers and the image was cut with a scalloped die from Sizzix. The green, grosgrain ribbon is from Crafty Ribbons and I simply cut a strip and adhered it like washi tape, using double stick tape on the back of it. I printed and hand cut the sentiment, inking the edges before adding it. The bow is one of my signature bows, this time with a gem added instead of a pearl. I used ProMarkers to color the image (a new one for me), selecting colors that were featured in the inspiration photo. 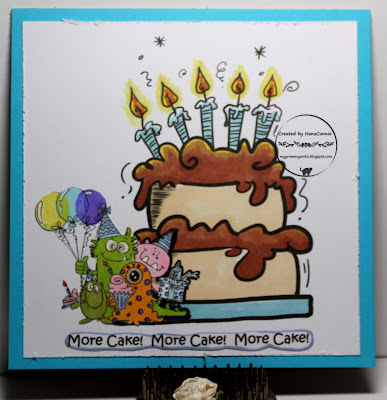 I used soft, golden, neutrals as much as possible on the critters, keeping the bold and bright colors for the word "Birthday." 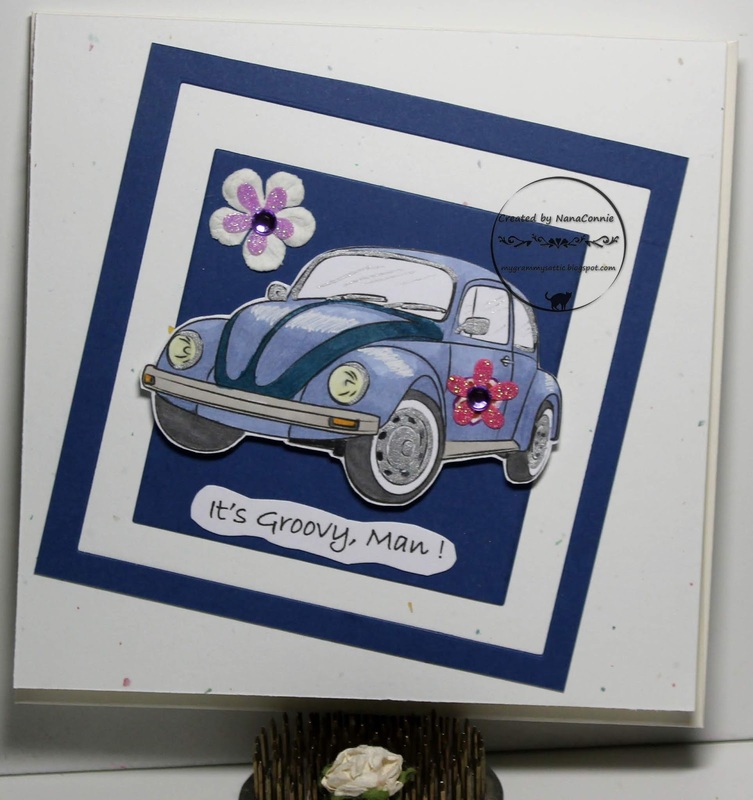 I cut the image with a large, rectangle die from QuicKutz and mounted it onto a gray-blue card base. The bronzy-gold ribbon was recycled from a craft store bouquet and the blue ribbon was in my stash. Fun how the edges of the two ribbons matched up. 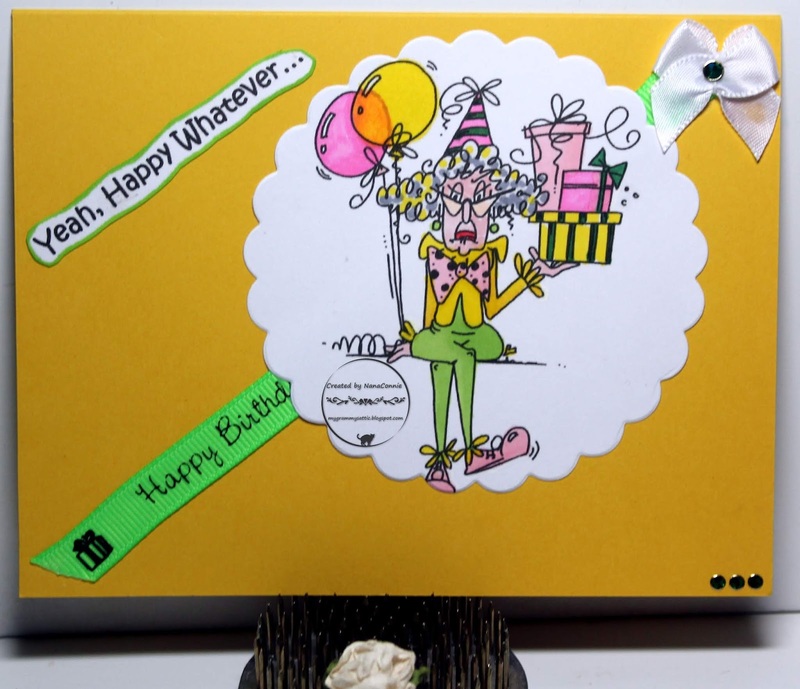 Well, that's six more birthday cards for my stash and I'll post one more, the last for the Catch the Bug Birthday Bash this week, later this afternoon. I'm so on target with my time frame for all the house projects which have to be done that I'm feeling calm and almost relaxed in the midst of the chaos. lol I'm sure that'll change tomorrow morning when three more major projects are on the list, including a meeting to sell some of the furniture pieces I'm not keeping! Before I tell you about today's post, let me give you a quick update. I've spent the majority of the last 4 days, sometimes long into the night time hours so the sleeping pattern has been badly disrupted, working on all the things I have to complete around the house. I've been packing boxes and it's amazing what one runs across during that process. I've been trimming down, throwing out, reorganizing -- all those things one does during this process. But yesterday, I awoke at 1:30 a.m. Since I was clearly wide awake, I gave myself permission to take a break and indulge in some crafting. I made a batch of cards for the week-long, daily challenge themes at Catch the Bug where they are celebrating their 9th Anniversary. That means they are just starting their 10th year and I want to help them celebrate that wonderful new beginning! They have a different theme for each day and we all have until Saturday evening to get our projects entered. So, I spent 7 hours making 6 cards, including coloring each of the Bugaboo Stamps images, and I'll make one more with Friday's Freebie Image once it's been released. I started with the sketch from Sketch Saturday. I colored with ProMarkers, then used two dies from Tonic Studios to cut the image and the aqua frame. I layered those two together, sandwiching the green, polka dot, ribbon between them, then mounted them onto sky blue CS. I printed and hand cut the sentiment, matted it with aqua CS, hand cut that, and added it to the bottom. Again, I used ProMarkers to color the image (which is a new one for me) but I cut this one with a die from Gina Marie. 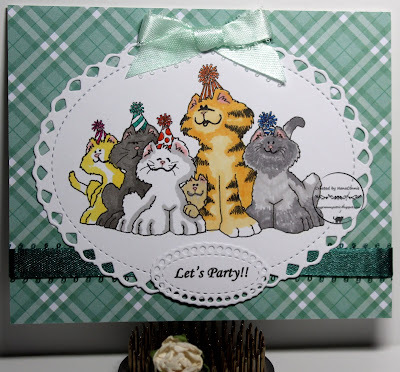 I used a square, kraft CS card base, then added the two narrow rectangles of glittered paper. I wrapped that with stitched ribbon from Crafty Ribbons before adding the image piece. I printed the sentiment, hand cut it, and then added the three rows of three metal brads to the top corner. 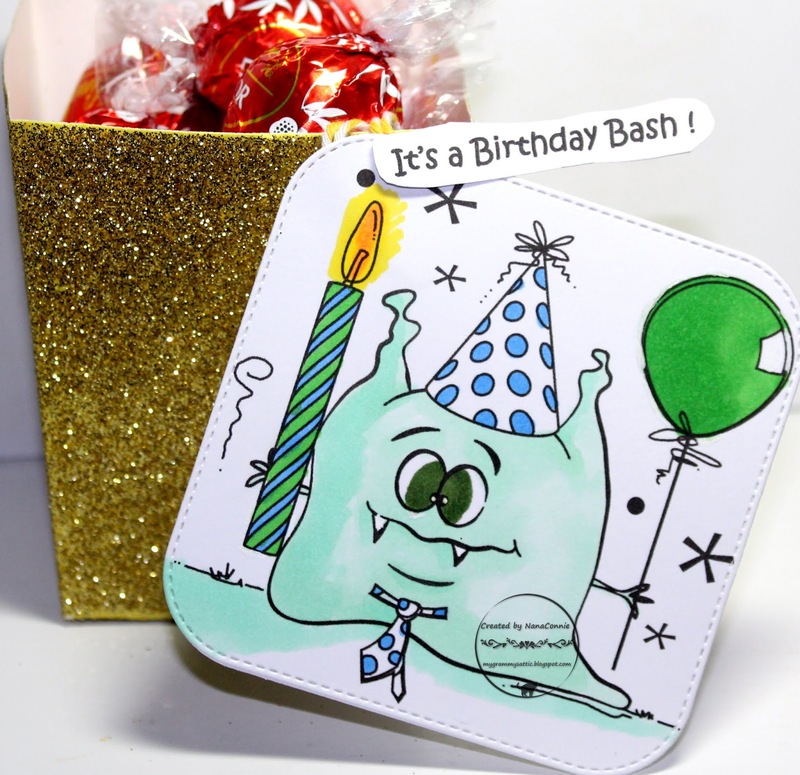 For this one, I did a party favor box with a personalized tag. I used one of my box dies from Spellbinders to cut glitter CS and fold it into the tall, box shape. The name of each guest is on the back of the tag. I colored the tag image with watercolor pencils and gel pens. I cut it with a stitched die from Cottage Cutz. I printed and hand cut the sentiment sand added twine to the corners of both the tag and the sentiment and taped the twine loops inside the favor box. I filled the boxes with chocolate candy. Once Christmas is over, it's time for all the Thank You cards. 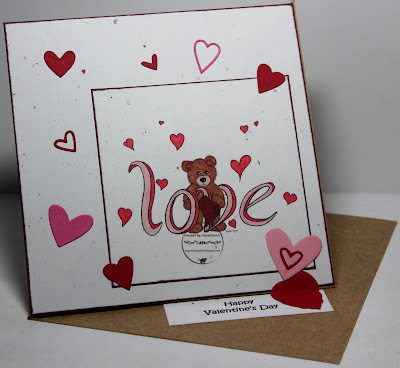 I've made a dozen or so and this is the one I did as my DT card for the newest challenge over at Creations in Pink. We don't have a sponsor this month but we're having a ton of fun doing "Anything Goes" projects with any supplies we wish! My design is all die cuts this time. 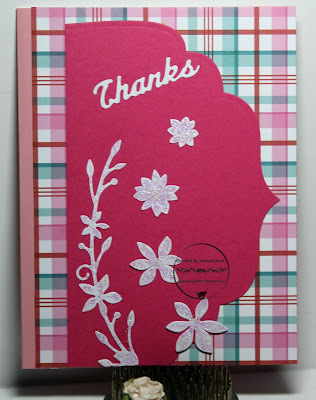 The main shape is cut from pink CS with a Spellbinders border die; the flower flourish comes from a Memory Box die, trimmed to fit; and the individual flowers are done with dies from that same set. The "Thanks" was cut with a Die-Versions die. That beautiful plaid dp is from a My Favorite Things stack. I added glitter to the flowers and everything was placed on a pale pink card base. New challenge at QKR Stampede this week, where our theme is always "Anything Goes." I thought it was time for a party so I got busy making up invitations. While I was away from the computer, coloring images, the feline fur babies took over and printed out this image, which they then insisted I use! 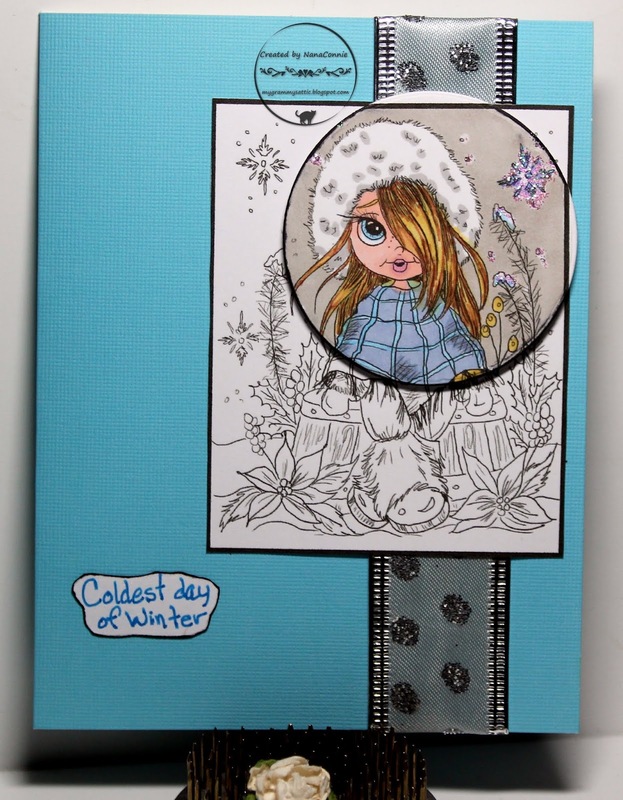 The coloring was done with ProMarkers and the image was cut with an Unbranded oval die. I found some of my favorite plaid paper in a stack by Your Next Stamp, called Mint Cocoa Kisses. The both the light and dark ribbons are from Crafty Ribbons and I hand tied the lighter ribbon into a bow. The sentiment was printed and cut with a smaller die from that same Unbranded set. In the meantime, here's my card for the Progressive Challenge at The Outlawz this month. The image came from SheepSki Designs. I started with scraps of confetti CS, printed the image on one, and trimmed the other piece to the size of the card front so that I could do a twisted easel card. I colored with ProMarkers and cut the image with a square die from QuicKutz. I inked the edges of both the image and the confetti CS square for the card front. The scattered hearts were all cut with dies from Spellbinders, Memory Box, or Lawn Fawn, all of which are brand new in my stash! How perfect to now have them for this card. :-D I used them to complement the scattered hearts in the image. The sentiment, together with one heart, is used as the 'stopper' for the easel. 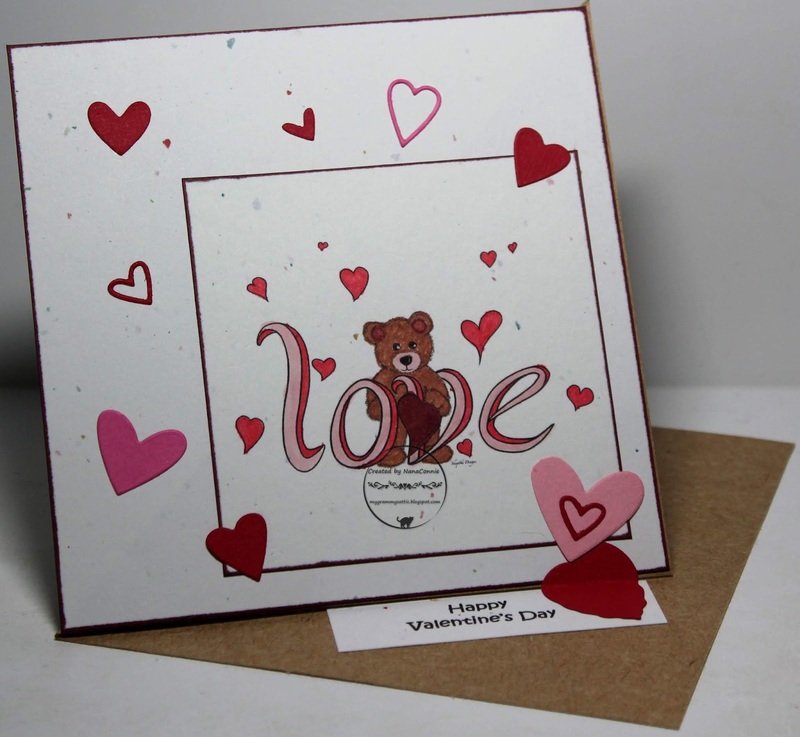 The card base is made with kraft CS and I love the contrast with the confetti CS. 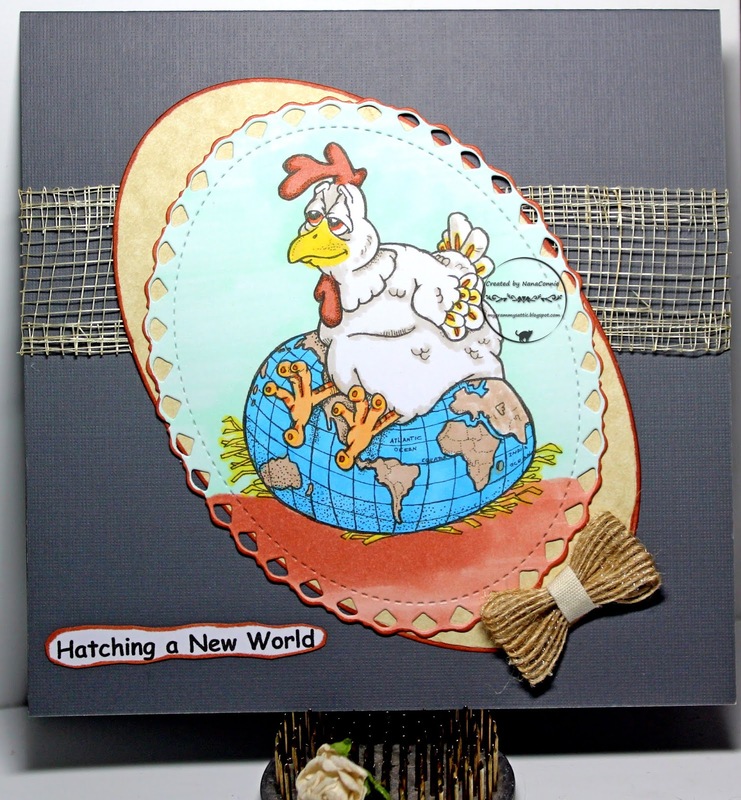 We start a new challenge over at Crafting with an Attitude and our theme is always "Anything Goes." 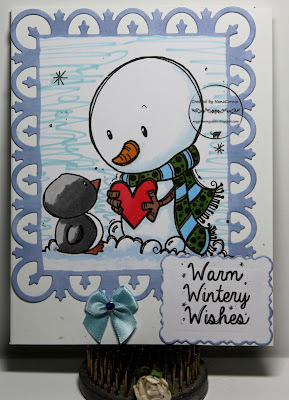 Our wonderful sponsor this month is Lacy Sunshine (Colour of Love) and I'm using a darling image called Rory's Winter Day. My colors came from My Favorite Things. 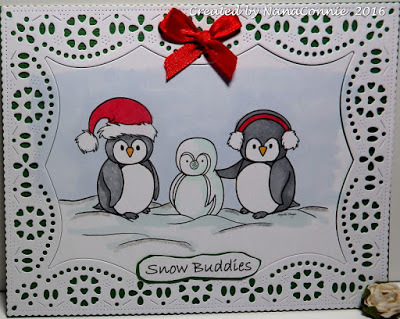 I decided to do a card using the 'spotlight' technique so I printed the image twice, cut one with a rectangle die from Spellbinders, and colored the second one with my ProMarkers, adding just a touch of sparkle with some glitter on the snowflakes. 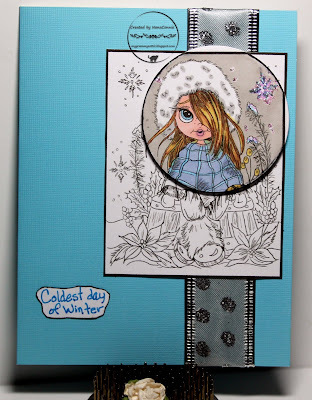 I found an icy-blue card base, wrapped it with sparkly, silver and white ribbon, then added the image. I printed the sentiment, hand cut it, and added it to the lower section of the card front. I think this is a delightful CAS design with just enough sparkle to celebrate the cold chill of early January!